Launched yesterday and previewed on our Facebook page, Vicem releases full details about the yard's second composite motor yacht, the Vulcan 32m Raised Pilothouse yacht, called Bronko I. Although Vicem is known for its traditional construction in cold-moulded wood, a couple of years ago, the Turkish yard started a new line called Vulcan, built in high-tech composite. The first Vulcan was launched earlier this year, the Vulcan 46m Tri-Deck. This second hull presents a motor yacht of 33.56m in a raised pilothouse version. Like her predecessor, Bronko I has an exterior design by Frank Mulder, a sporty profile without compromising the interior volumes. The interior, designed by Vicem in collaboration with Wetzels Brown Partners, accommodates 10 guests in five cabins. The full-beam master suite is on the main deck, while a full-beam VIP, a double and two twin cabins are on the lower deck. Bronko I is powered by twin 1,900hp Caterpillar engines, giving a top speed of 23 knots and a cruising speed of 18.9 knots. She has an interesting range of 1,350 nautical miles while navigating at a fin-stabilised speed of 12 knots, all within RINA Short-Range Charter class certification (and MCA compliant). Following her sea trials, Bronko I will be delivered before the end of the year. 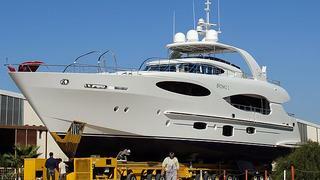 A third 35 metre motor yacht from the Vulcan series, in a trideck version, will be launched in March 2013.